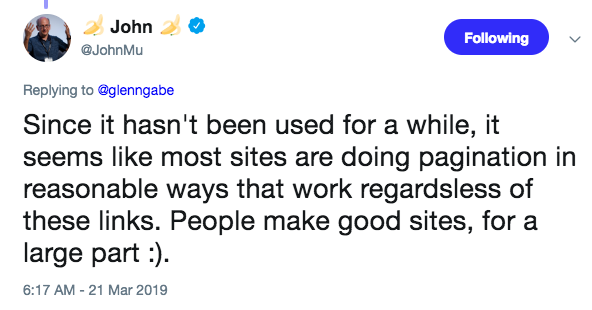 Bubbling up from the depths of search nerdom (Hat tip to Adam Gent) over the past 48 hours…some overly observant search nerds have picked up on the fact that Google is no longer supporting pagination, yet had failed to mention this to anyone. Today Google’s John Muller acknowledged that not only was Google disregarding rel next/prev, but had been doing so for years. I’ve personally noticed this anomaly while doing “site: searches” and locating paginated results with that result set. Seemed odd. This is especially impactful (at least theoretically) to law firms utilizing WordPress based sites who have been heavy content publishers and/or grossly overusing Tag and Category pages. Both of these tactics can lead to the generation of multiple, paginated pages. The pagination code, simply put, helps google understand that a sequence of pages are a list of items all related to each other. The most obvious example is a site with hundreds of blog posts, which creates a series of useless sequential navigational pages in groups of 10 blog posts each. This also happens automagically with WordPress sites with the use of Tags pages and Categories. The pagination code simply instructs the search engines that all of those pages in the sequence really belong as the same page. This is important because (at least in theory) these paginated navigational pages offer no unique content and really a very poor destination for users. Overall, they serve to dilute the quality of content and careful management of them can actually decrease page count while increasing traffic. 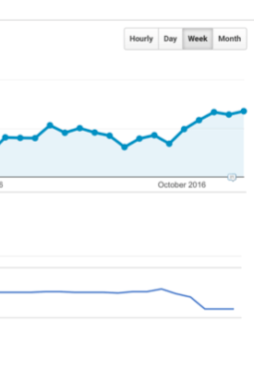 The accompanying graphic shows how we reduced a law firm’s site page count by 149 tag pages which resulted in an immediate increase in traffic. Now, apparently one of the tactics to manage these useless pages, not only no longer works, but hasn’t worked for a while.